Electron micrograph of TEX produced by a human head and neck cancer cell line, PCI-13. TEX were isolated from the cell supernatant by ultracentrifugation. The pelleted TEX were fixed with glutaraldehyde, dehydrated, and embedded in Epon. Ultrathin sections were cut, stained with uranyl acetate, and examined by transmission EM. 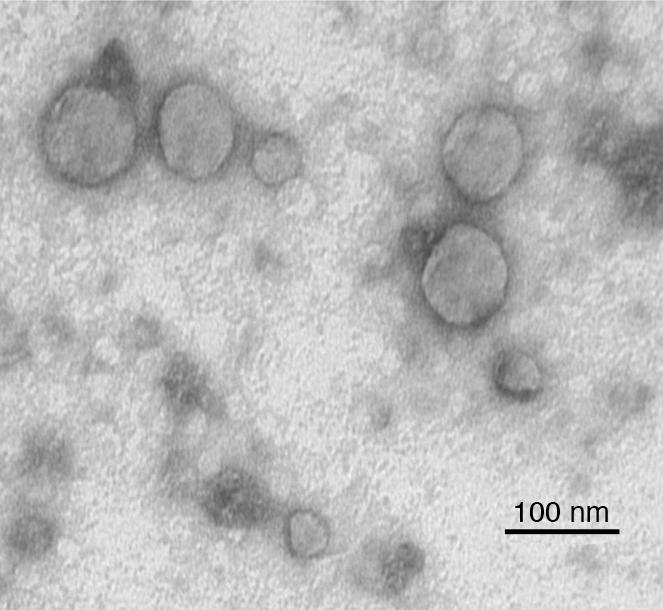 Note the variation in vesicle sizes. Image courtesy of S. Watkins (University of Pittsburgh, Pittsburgh, Pennsylvania, USA).